Kids used to play in the backyard a lot more than they do in this day and age. Now they have own PlayStations, Gameboys, flat screen TVs, I-Pads and every other cool gadget they could ever imagine. Why bother go outside when all you could ever need is safely indoors where its warm and dry. Not to mention that TV shows are just too good to stop and now with TiVo you can record any show you missed at school and have it waiting for you when you come home from school. Thus the age old battle was born. Parents have been trying to get their kids out of the house, to turn off the television and go kick a ball around for decades. Parents needed some sort of incentive to get their kids out of the house and to get their heart rate up. Parent say it’s because playing outside is very good for their children. But I would venture a guess that it’s more likely that they just want some peace and quiet for once. If their kids are outside having a good time then the parents can bust out the wine early and finally get some alone time. Whatever the reason, parents want kids playing in the fresh air more often and kids don’t seem to want to budge. That’s why these parents and grandparents got creative. Granted, they probably had a lot more resources to pull it off than most families do but we applaud their efforts nonetheless. Some parents even made affordable DIY backyard ideas that we just love! If you need help getting your kids out of the house then look no further. We do have to warn you though, these backyards are so awesome that your kids may never come back inside. Your newest problem will be how to get them back inside to shower them off and put them in bed. These backyards have been designed to please any child’s wildest dream. From working trains that wrap around your house to beach themed pools, who wouldn’t want their yard to look like these pictures. 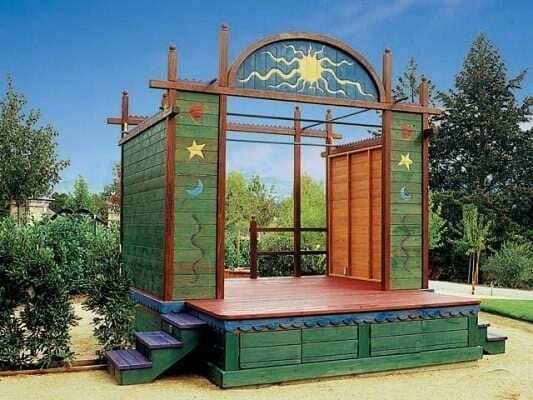 Some backyard ideas are clever and educational and some are just plain old fun. Because after a full day of work or a long hard day at school nothing is better than kicking back and relaxing in your very own five star backyard. Theres ice skating rinks and trampolines, pools and even tree houses, these yards are the coolest that we’ve ever seen. Most people spend their snow days in doors with hot cocoa and movies. But not Jay Venini. He was going to create a master piece for his kids. At least thats what he told his wife. We think it was really for himself. So Jay put on his gloves, his snow pants and took the shovels out from the garage and got to work. 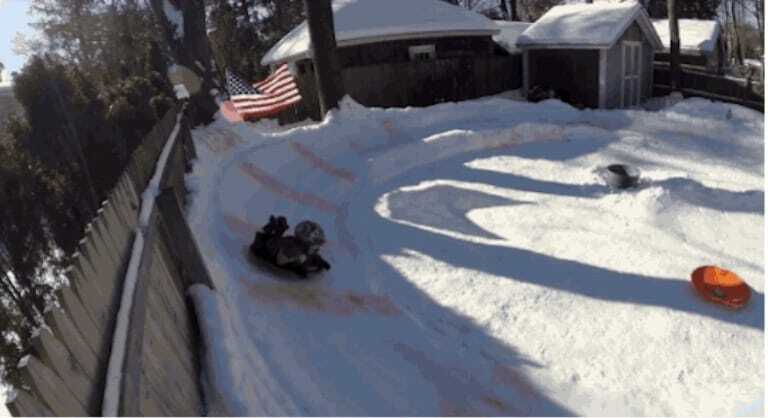 Jay built a luge for sledding in his backyard and his kids have never loved him more. There is currently a line of kids at their front door. 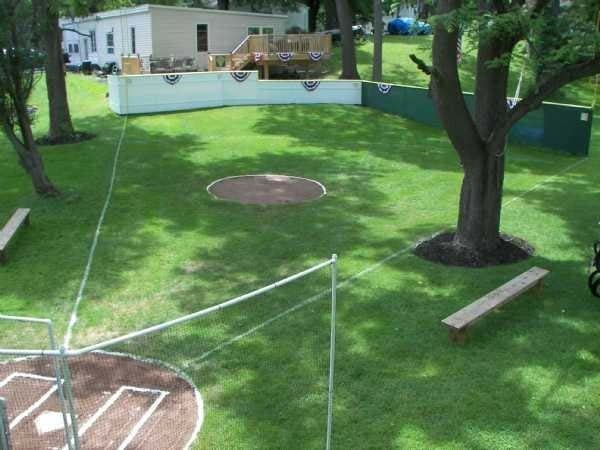 Why schlep all the way out to a baseball field when you can bring the baseball field to your backyard. There is no excuse left for the kids of this house to not put on their gloves and get practicing. These kids will go pro in no time with a base ball stadium right in back of their house. This stadium was named Ridley Field and regularly hosts games played by the kids in the community of Mumford, NY. Amusement parks are anything but cheap. You could easily shell out 70 bucks a kid, now imagine if you have more than five kids. It’s no wonder that parents aren’t too keen on taking their kids out for a fun day at the amusement park. So grandpa John took things into his own hands. 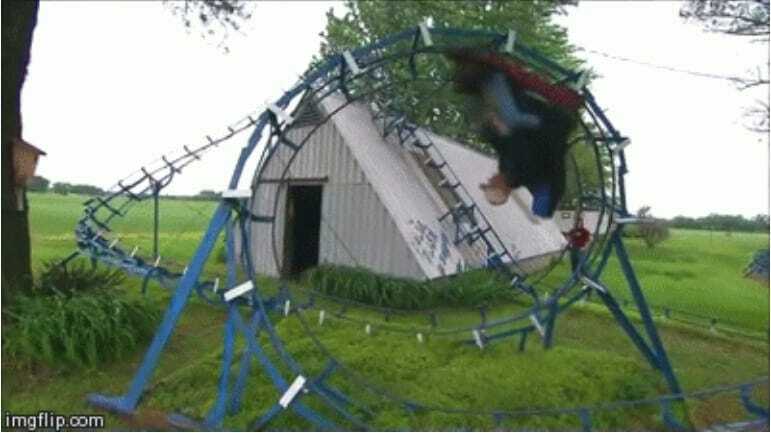 He decided to build a roller coaster for his grandchildren. He named it Blue Flash. He is officially the king of grandparents. We just hope the kids don’t ride Blue Flash after dinner. This Canadian family was sick and tired of shoveling their driveway and heating up the car in order to get to the local ice skating rink. Why bother when you can just go skating in your backyard anyway right? Not to mention that all the amateur ice skaters at the public ice skating rink posed a threat to their kids. So they took advantage of the cold weather and built their very own ice skating rink. 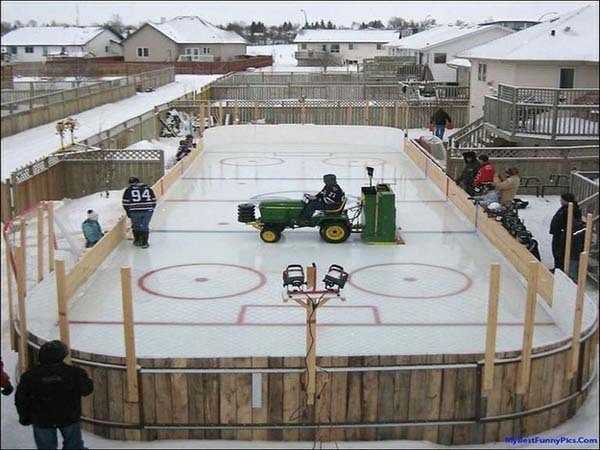 We’re not sure how they got the zamboni though. Castles, zip lines and slides oh my! Jeri and Steve Wakefield clearly heard about Grandpa John’s roller coaster and are competing for the title of best grandparents. And they just might take the win. Steve and Jeri built their grandkids a castle! 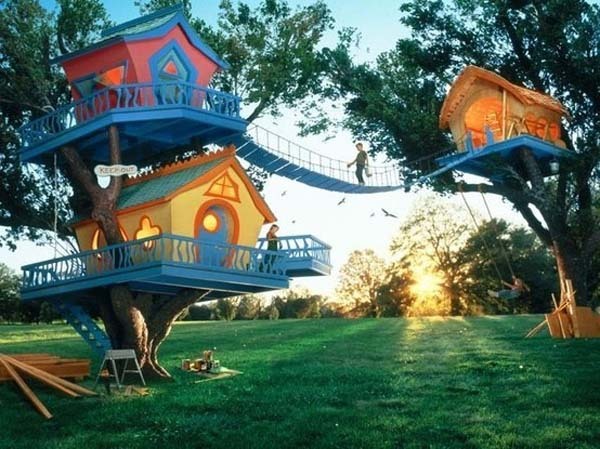 This is no ordinary tree house. There is a zip line, a climbing wall and even a slide! I think that it’s safe to say that these kids will be calling in sick from school more than the neighbor’s kids will. The neighbors are definitely jealous though. This might not technically have been built in a backyard but we had to include it anyway. Forgive us, but it’s actually a Hobbit house! 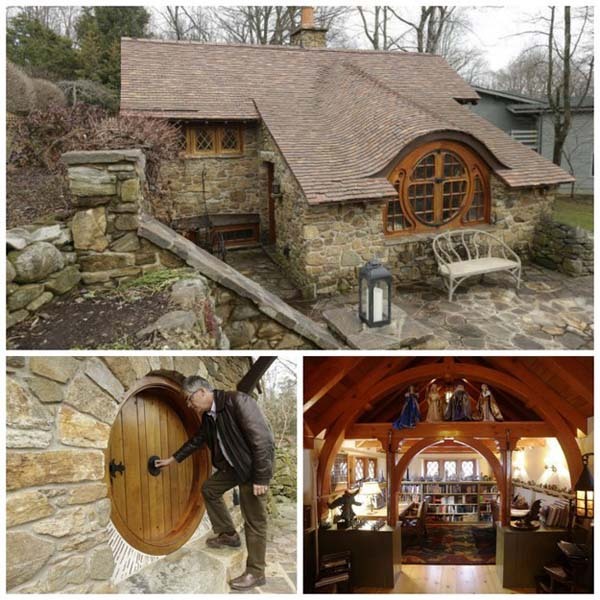 Architect Peter Archer was hired to build this hobbit house for a J.R. Tolkein fan and we think it was worth every penny. I do hope however that his back is not damaged by bending over every time he has to enter and leave his own house. Now when he watches the Lord of the Rings and The Hobbit, the movies really come to life. The romantic and gorgeous city of Paris was just too far away for Gerard Brion. Why spend all that cash trekking to France, getting on the plane, packing and making the schlep when he could bring Paris to his own backyard. Literally! 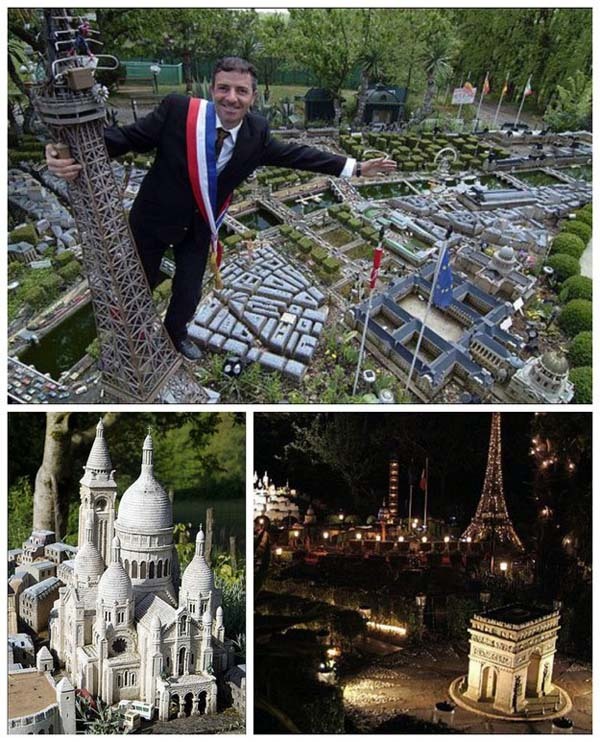 Brion used 100 percent recycled materials that he found in order to build this model of Paris in his backyard. ‘Little Paris’ is slowly becoming a tourist attraction for his neighbors and fellow community. 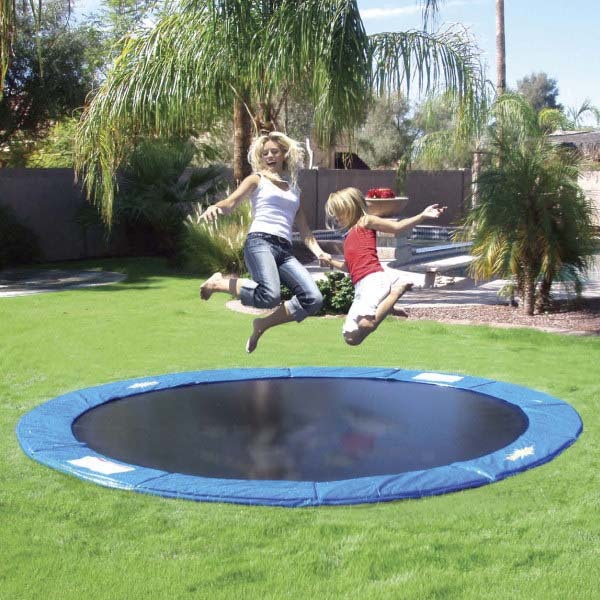 Tired of the bulky look of a trampoline in their backyard, this architect mom took out the poles and built the trampoline right into the ground. It wasn’t simple. She needed to dig a massive whole in the ground. So she enlisted her sons and husband for help and got to work. Then she dismantled her trampoline and took out everything that made it stand above ground. She then placed it over the ditch and carefully installed it in. We applaud this DIY mom and her happy child thanks her. Dr. Seuss comes to life! 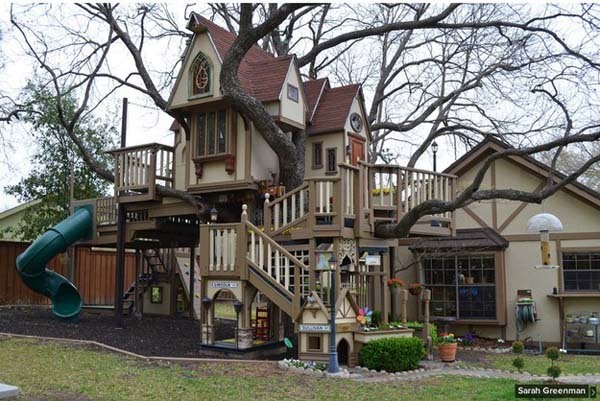 We are curious what the main house looks like if this is only their “tree house” out back. I guess these kids really liked their Dr. Seuss stories. Either that or their parents were trying to inspire them to read more. Whatever the motivation, these kids will not be coming back in doors any time soon. There are three tree houses connected by a pretty dangerous looking bridge. One of the tree houses is complete with its own fridge and they all have electricity and other fun amenities. 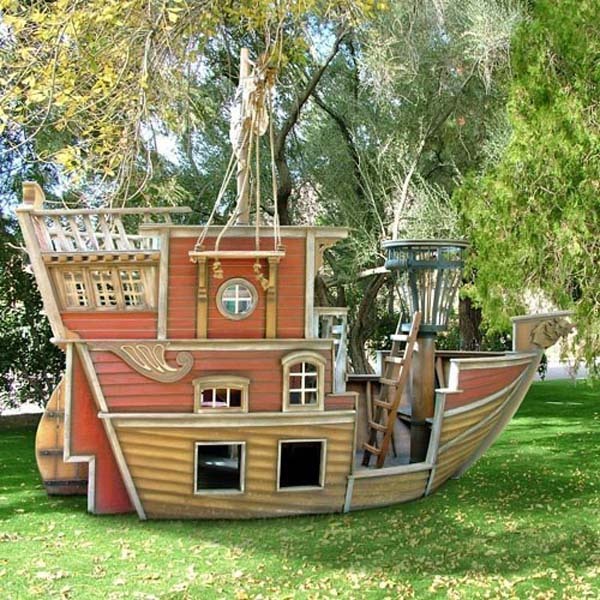 Why buy a real boat or yacht when you can spend $52,000 for a play boat in your backyard. Ya, that makes total sense. Their kids aren’t complaining though. They have their very own boat in their backyard, life has never been so sweet for fifth graders around the world. Inside the “Red Beard’s Revenge” is a dining room table set, a mini fridge and everything else kids would need so that they will never have to step foot in their home again. I think that’s the parents’ point. My childhood definitely looked a whole lot different than this. If we wanted to play when we were younger we would have to use hand me down barbies and an imaginary houses. 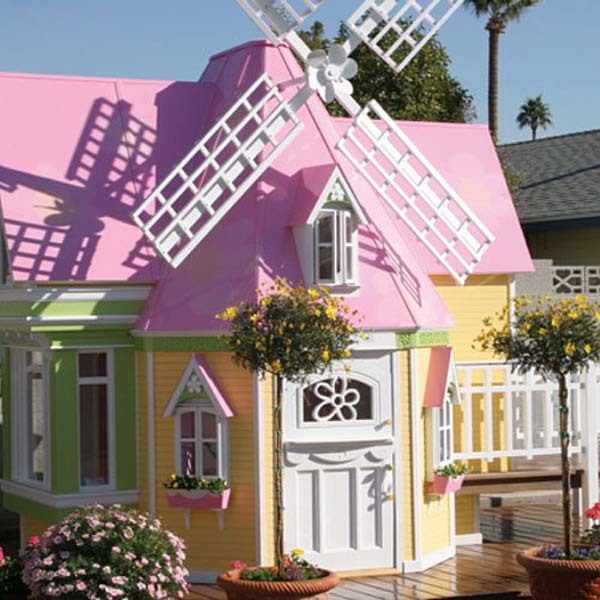 These kids on the other hand got a $38,000 dollar windmill playhouse. No, i’m not jealous at all why would even say that. This windmill house build by their parents’ architect was designed by the children themselves. Complete with a brand new barbies and a tea set. This isn’t only every child’s dream come true but this also rocks for the parents! Why bother watching a movie on the couch like every other conventional family when you can get your movie on while floating in the pool! This takes the old school drive ins to a whole new level. Summer just got a whole lot more fun. This family is now the envy of every one in their town. 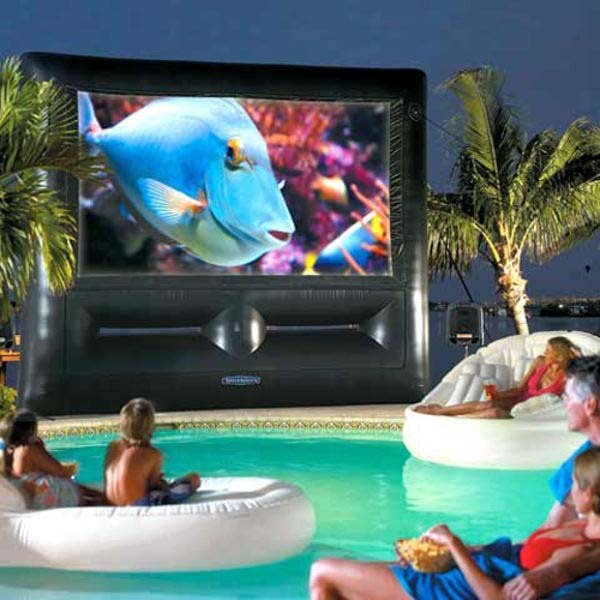 I for one think that it’s the most perfect place to watch Finding Nemo. 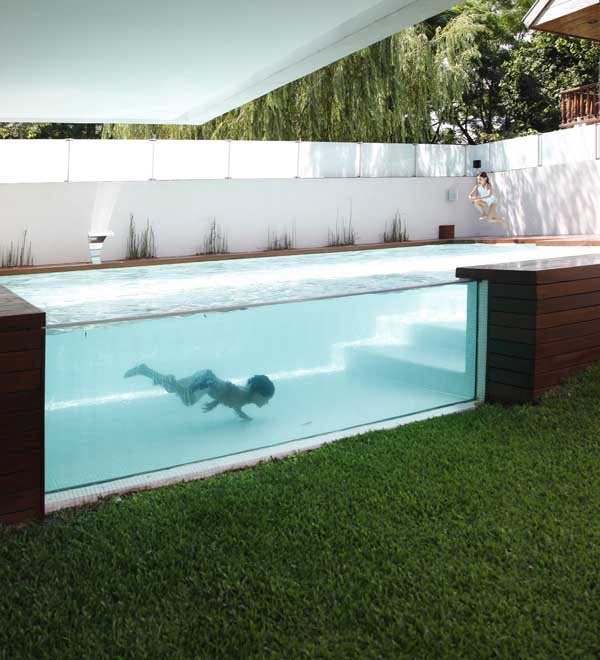 This backyard infinity pool has a glass wall so that you can make sure your kids are still safe from your living room. No life guard required, you can now keep an eye on the kids a whole lot more easily. However, the one catch is now you realize just how weird you look swimming under water. Architect Andres Remy’s pool has made the lives of parents more simpler. Just don’t forget that skippy dipping is a little bit more risky in this pool! This slide looks like it was inspired by the halfpipe snowboarders use for tricks. But we like this version more. Waterparks watch out, you may be put out of business soon my awesome parents. Staying home for summer instead of going to summer camp or vacation doesn’t sound so bad anymore. The only question remaining is how does their mom get the kids back inside to shower and go to bed when they have this epic ride in their back yard. But a more important question is, when is it my turn? 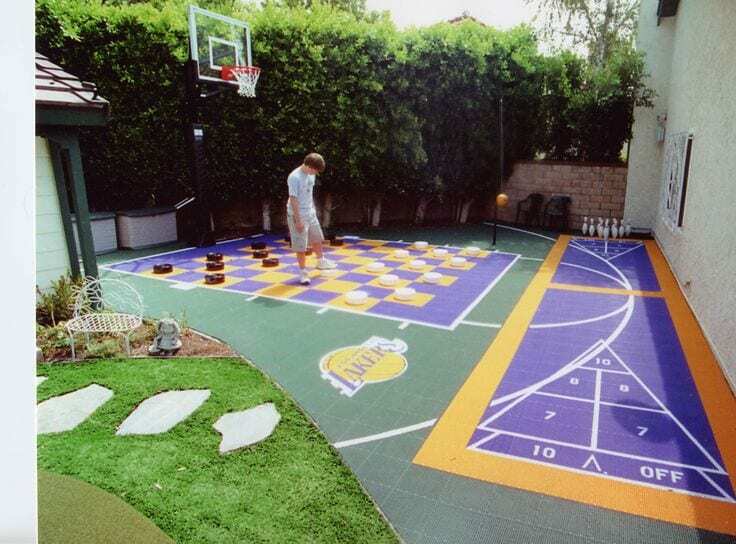 This Lakers fan was bored of the classic backyard basketball net. He needed a little bit more entertainment in his life. So he added all these games painted onto the floor in case he gets frustrated from missing his jump shots and wants a break from basketball. Now he can play checkers as well. His wife didn’t see the Lakers sign on the floor so she asked her husband why their backyard was Barney themed. Have you ever decided to not go bowling because you weren’t in the mood put on those used and smelly bowling shoes? Now you don’t have to! 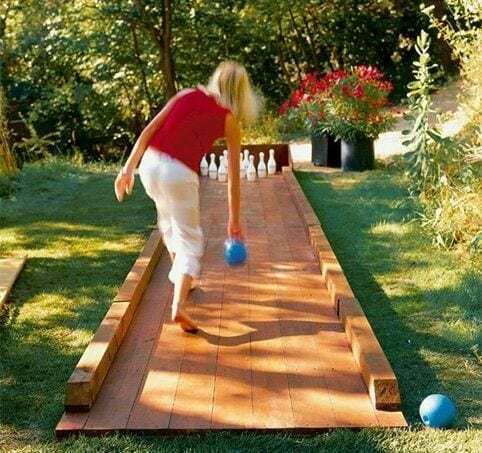 Bowling in the yard is fun for the whole family. Although it might get a bit confusing to keep track of the points by hand. Not to mention that you actually have to go pick up the pins when you knock them down. I would probably miss on purpose. This mini water park is awesome for little kids. However it might not be so great for the water bills. But your smiling giggling kids’ faces will make it worth your while. If it’s too cold to play in the water the kids have the alternative to play in the jungle gym in the back, complete with a rock climbing wall and a slide. 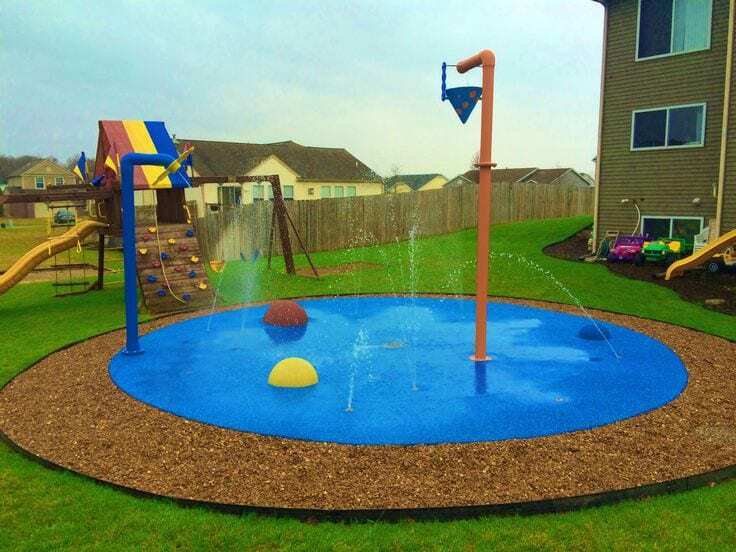 Your kids will definitely thank you for making this investment and bringing this to your backyard. This cult classic is loved by all for a reason. It’s simple, it’s fun and it builds character. Your kids will work on their team skills while having a great time doing it. This full court actually allows kids to play a full game of basketball. Forget playing HORSE, bump and every other fallback game. 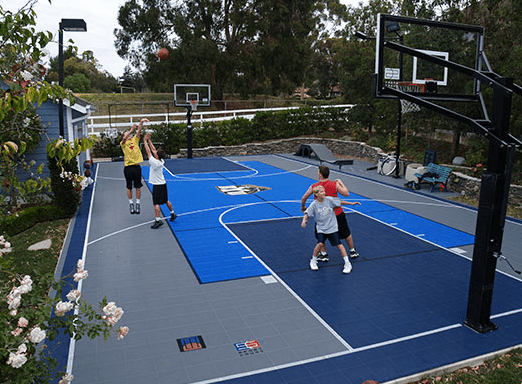 Now you can even play a scrimmage basketball game of house team versus the neighbors. It’s a safe and sure way to get the kids off their Playstation. This is no ordinary swimming pool. This pool emulates the beach, get on your sun tanning chair and feel like the tide is high today. The jets pouring out of the side of the pool doesn’t hurt either. And if you don’t feel like getting wet then feel free to grab a book and lie on the beds beside the pool and stay dry in style. 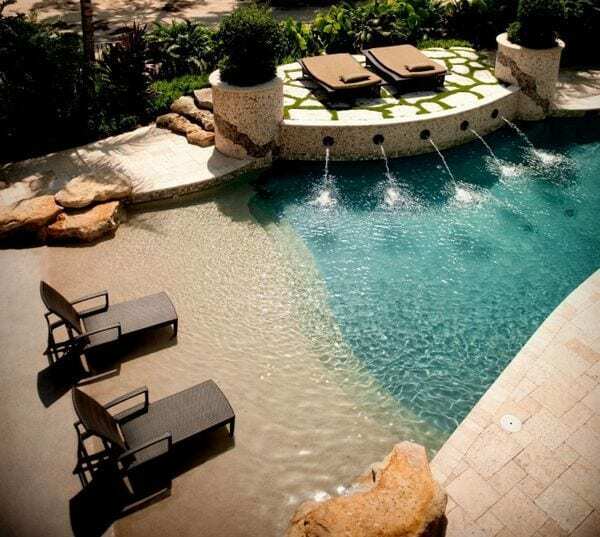 Whatever you decide to, its obvious that a good time is guaranteed in this awesome pool. If you don’t like camping but still love the camp side fire then this backyard is perfect for you. I can already smell the roasted marshmallows being made into the perfect smore. 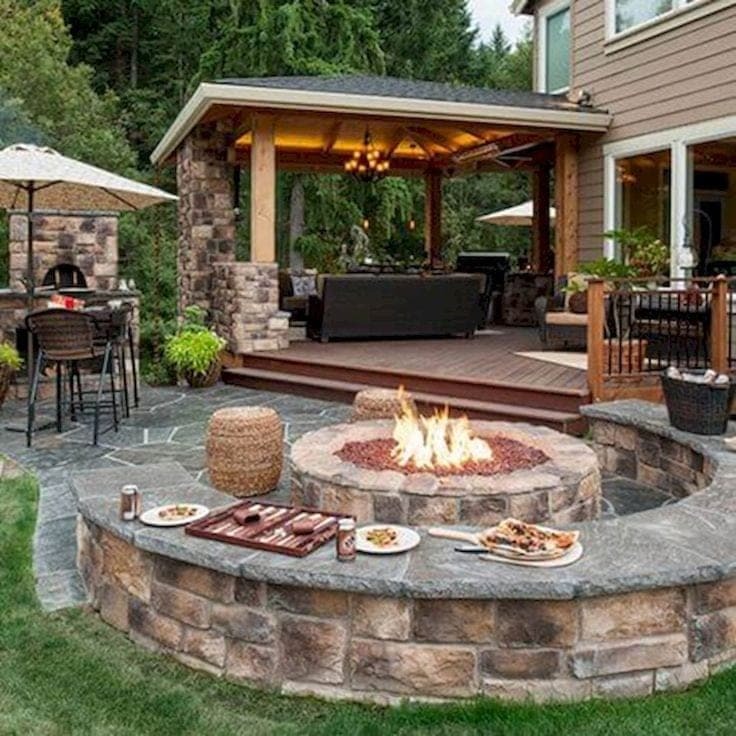 This backyard is awesome for every member of the family and is perfect for any backyard barbecue party. While the parents sip on their wine in the black couches the kids can watch the bonfire and tell scary stories while eating their delicious smores. This hammock can be enjoyed by all ages. Want to take a nap? Read your favorite novel? Take a break from the kids? Or even win at hide and seek? This hammock fulfills all your needs. This isn’t just any regular hammock though. 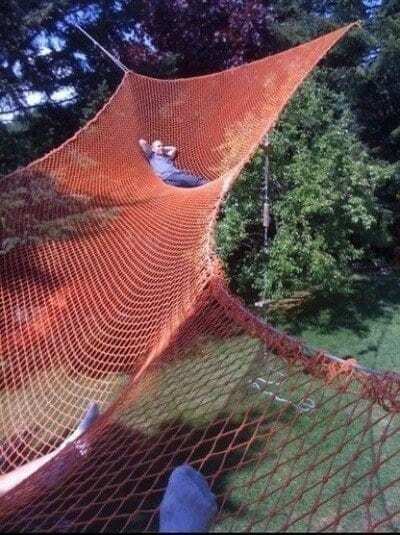 This is a super hammock! It can fit anywhere up to five adults simultaneously and still comfortably. I can’t say that i’m a fan of the fire engine red color choice, but I would still buy two regardless. This BMX skatepark just blew every other backyard out of the water. There are over twelve half pipes to do tricks on. Not to mention a bike shed complete with every bike you could even need. Notice the house has all glass walls so that everyone inside can have front row seats to the show. Now all you have to do is learn how to pull off that trick with out killing yourself in the process. Looks easy enough for me. If you have noticed that your kids have a dramatic flare or have been signing up for drama club then this is a must have in your back yard. Kids can put on plays for the rest of the members of the family. Or if you want to teach your kids a lesson in a creative way then get on stage and teach them about the birds and the bees in a fun and catchy way! Get your popcorn out because the show is about to begin! Too lazy to cross the yard by yourself? No worries, this dad has got you covered. 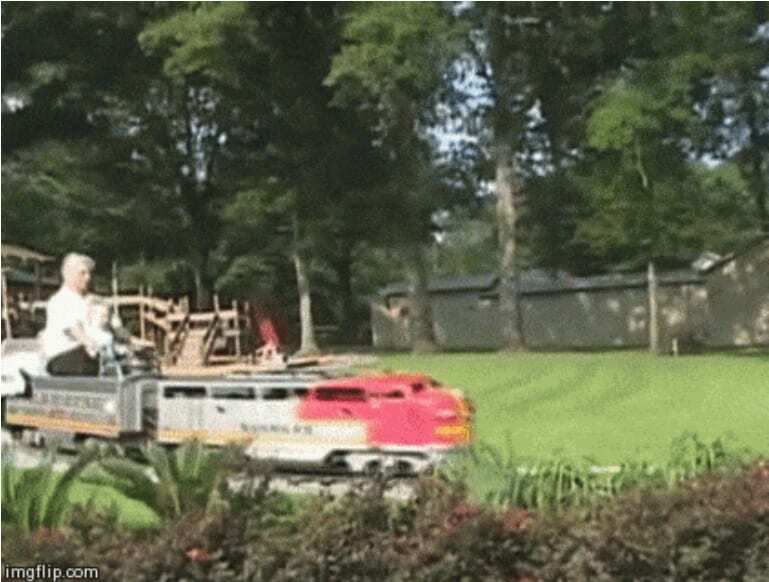 This train not only takes you through the entire backyard but also wraps around the entire house. Forgetting a scarf out back has never been so simple. This father was an engineer and made the coolest father son project we have ever seen. If you ever want your kids to follow in your career footsteps then take a page out of this dad’s book and make it fun! 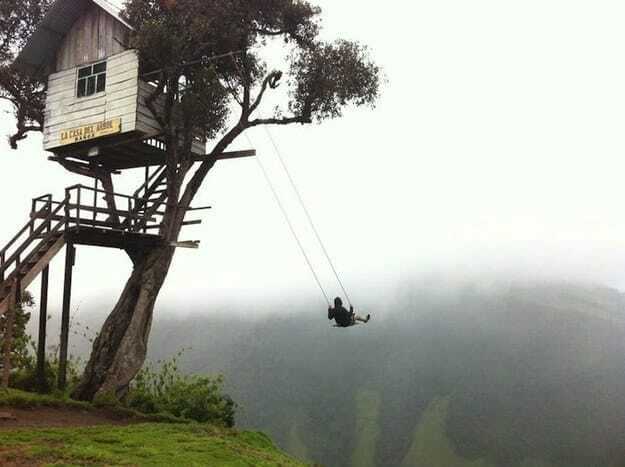 This swing is unlike any other swing for very obvious reasons. There is no need for a sales pitch here. This is simply awesome and we want one too. But. There is a small catch. Where is his seatbelt? What if his palms start to get clammy and sweaty from all the excitement and he slips? That looks like a long fall down. There is no way that this is safe. Regardless, I would still one hundred percent try it out for size.